Mobile Wallet — Your Smartest Wallet Ever. 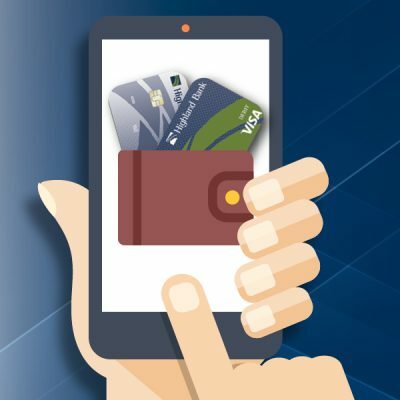 Mobile Wallet offers an easy way to pay without pulling your debit card out of your wallet! Now you can use your Highland Bank ATM/Debit Card on your mobile device with Apple Pay®, Google Pay, or Samsung Pay. It’s our goal to give you convenient access to your money whenever and however you need it. As new and improved mobile and online services become available to help you shop, pay, and manage your money, count on Highland Bank to provide you with reliable options that fit your lifestyle. Make in-store purchases by holding your device in front of the terminal. The information is stored with encrypted codes not account numbers. Download the mobile wallet app (or it may be already built into your mobile device). Add your debit card information to the mobile wallet app. When you check out at participating merchants, access the mobile wallet app and choose your debit card. If you’re making an in-store purchase, just hold your mobile device at the terminal. Pay using your Android device. Pay using your Apple device. Pay using your Samsung device.